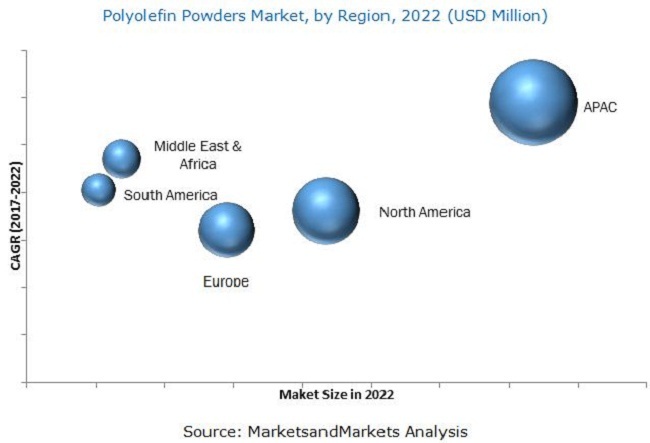 [146 Pages Report] polyolefin powders market was valued at USD 6.46 Billion in 2016 and is projected to reach USD 8.48 Billion by 2022, at a CAGR of 4.62% between 2017 and 2022. 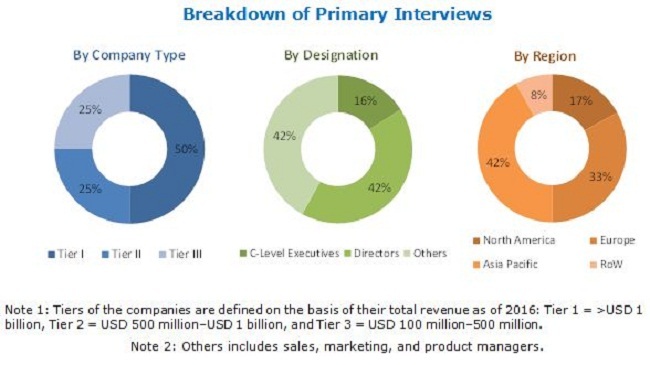 The report segments the polyolefin powders market on the basis of chemistry into polyethylene, polypropylene and EVA; on the basis of end-use industry into toys, tanks & containers, automotive & transportation, paints & coatings, cosmetics, batteries, building & construction, and others; on the basis of application into rotomolding, masterbatch, and others, and region into North America, Europe, APAC, the Middle East & Africa, and South America. Base year considered for the study is 2016, while the forecast period is between 2017 and 2022. The rise in demand for polyolefin powders in various end-use industries, such as toys, tanks & containers, automotive & transportation, and paints & coatings is driving the polyolefin powders market. Top-down and bottom-up approaches have been used to estimate and validate the size of the global market and various other dependent submarkets in the overall polyolefin powders market. The research study involves the use of extensive secondary sources, directories, and databases such as Hoovers, Bloomberg, Chemical Weekly, Factiva, Chemical Fabrics & Film Association (CFFA), The Association of Rotational Molders (ARM), European Chemical Agency (ECA), European Automobile Manufacturers Association (ACEA), Independent Cosmetics Manufacturers And Distributors (ICMAD) and other government and private websites to identify and collect information useful for the technical, market-oriented, and commercial study of the polyolefin powders market. Polyolefin powders are manufactured by grinding raw polyolefin pellets under cryogenic conditions in the presence of grinding aids. Major players in the market are LyondellBasell (Netherlands), Ineos (Switzerland), Borealis (Austria), Mitsui Chemical (Japan), SABIC (Saudi Arabia), Exxon Mobil (US), and others. This research report categorizes the polyolefin powders market on the basis of chemistry, application, end-use industry, and region. The polyolefin powders market is estimated to be USD 6.76 Billion in 2017 and is projected to reach USD 8.48 Billion by 2022, at a CAGR of 4.62% during the forecast period. It is driven by its use in different end-use industries, namely, toys, tanks & containers, automotive & transportation, paints & coatings, cosmetics, batteries, building & construction, and others. The high demand for polyolefin powders from the rotomolding application of toys, tanks & containers end-use industry, and SMC, BMC, and carpet applications of the automotive end-use industry is also driving the polyolefin powders market. The demand for polyolefin powders in the rotomolding application and automotive & transportation, and paints & coatings end-use industries is high, especially in China, India, and Brazil. Emerging technologies and innovations drive the demand for polyolefin powder in these industries. APAC is estimated to witness strong growth over the next 5 years. Different grades of polyolefin powders are used in the industries based on their requirements. They have distinct properties, which vary according to application requirements. These are classified based on their chemistry, namely, polyethylene, polypropylene, and EVA. Polyolefin powders is a thermoplastic powder, and this market is based on its demand from various applications such as rotomolding and masterbatch. There is a huge demand for polyethylene powder in the rotomolding application. The growing demand for polyolefin powders from the rotomolding application in end-use industries such as toys, tanks & containers, and automotive & transportation, and masterbatch applications for industries such as paints & coatings, cosmetics, and battery is expected to drive the market. However, government regulations and economic slowdown are affecting market growth. Products based on plastics microbeads such as PE and PP are banned in most countries of Europe and North America due to their effects on the environment and marine food cycle. Thus, this factor is restraining the growth of polyolefin powder market in these regions. Key players operating in the polyolefin powders market include LyondellBasell (Netherlands), Ineos (Switzerland), Borealis (Austria), Mitsui Chemical (Japan), SABIC (Saudi Arabia), Exxon Mobil (US), Eastman (US), Merck (Germany), Wacker Chemie (Germany), Axalta Coating Systems (US), and others. Diverse product portfolio, strategically positioned R&D centers, continuous adoption of development strategies, and technological advancements are factors strengthening the market position of these companies. These companies have adopted various organic and inorganic growth strategies to enhance their current market share of the polyolefin powders market. 11.3 Ineos Group Holdings S.A.